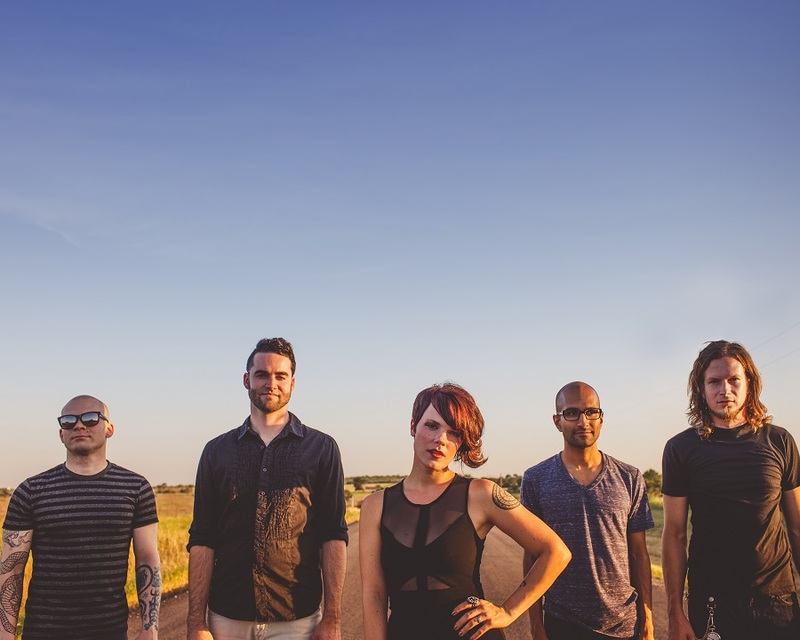 From tour release: Flyleaf’s style of hard rock is reminiscent of Deftones, Evanescence and Chevelle. Heavy riffs, thrilling arrangements, memorable melodies and mammoth choruses all blazing with a fresh fire and uncontainable energy, spreading positivity and encouraging hope in their fans. Flyleaf released their acclaimed self-titled album in 2005. The band supported the album touring through 2006-7 on the Family Values Tour with Stone Sour and Disturbed in the US and an appearance on Australia’s Soundwave. Rolling Stone Magazine proclaimed Flyleaf as one of the breakout bands of 2008. In 2009, Flyleaf released their sophomore album, “Memento Mori” to even wider acclaim. The band’s latest album, “New Horizons” was released in 2012 and is the band’s most explosive, expansive, and enigmatic work yet. The band’s subsequent tour introduced fans to new vocalist, Kirsten May formerly of Vedera. You’re heading back to Australia for the first time in six years, what can fans expect to see on this your first headlining tour? Well you’re going to get to experience Kristen May who is just spectacular, she’s so good, and you’re going to experience the new record live and so much energy. I saw you in Sydney back on Soundwave back in 2007, do you have any memories from that first trip over? I do, man, so many memories, it was an amazing trip all round, getting to see Australia with Deftones and the people there are just amazing, there’s something about Australia that reminds me of Texas, as far as I’m not sure what you call it, but we call is Southern hospitality and everyone’s just so polite and so hospitable and it kind of reminded me of being home actually *laughs*. You guys have beautiful beaches and beautiful landscape and stuff. With ‘New Horizons’ released at the same time as Lacey’s departure and obviously the change of a singer is a pretty big thing for a band, was Kristen someone you’d had in mind straight away? Oh she was, you know we had compiled a list of singers that we thought would be really good for Flyleaf, and she was definitely at the top of the list. How did you know that she was the right person for the job? You know from meeting her, that initial meeting she and me clicked right away and after getting to talk with her and hearing her convictions and her take on the music and just her heart, that was a huge part of it. Then when we went into the practise room ad from that first note she sang we were just blown away, she’s so good and so passionate. Also with no real time to get her feet wet, how has Kristen made the transition into the band and were you able to gel straight away or were there a few hic-ups along the way early on? I don’t think there were any hic-ups, because we all know each other, it was just due process, I really can’t say there was anything that kind of snagged as we were progressing toward this. It was very smooth. So what has she brought to the band that you feel may have been missing previously? The word that keeps coming up is rejuvenation, it’s just fresh and feels like something, it is new, she’s not Lacey, but there is this freshness and rejuvenation in the music and in her voice and really enchants you and it’s an amazing experience. I know it’s only early days, but have you already thought about the possibility of writing new material with her? Yes, actually we’ve already written a few songs and we’re still writing, we recorded some with Howard Benson, our long-time producer and we don’t have a release date set just yet, actually we’re still writing, but in the short time that we have with her, it’s so good. It’s so easy, we went in, we had some ideas, she said she had some ideas and we started collaborating and it was like we’d written together for ten years, it was that easy. Is there any chance of road testing some new ones while you’re out on tour to see if they work? Yeah, I think we’re coming up on a tour in August and coming to Australia in August and I think by then we’ll have a few new songs that we’re going to add into the set. On the new album, Song wise, the songs are so melodic that it’s insane; I absolutely love the album, what inspired the songs that ended up on New Horizons? Life. We have experienced a lot, from ‘Memento Mori’ up until ‘New Horizons’, people were growing up, we’re starting families and really focusing on what we’re trying to do, I don’t even know if we’re trying to focus on it, we’ve just had a priority check shift and found what’s really important in life and found more and more that it’s not any type of success in the sense of how much we’re making or how many records we’re selling or what size house we live in, it’s more and more about people. I think what really is a priority or should be, is your relationships with people and I think that’s what ‘New Horizons’ is all about, getting to start over again and shift your priorities from, not that we were into material things before, but it’s a realisation of wow, and we’ve always said it’s important and what we believed in, but now it’s becoming real as we’re getting older and the decisions we make have heavier consequences, we’re not kids anymore, we can’t just screw up and then it’s all better the next day and being with our friends, every decision you make has a consequence and were more conscious about the decisions we make, whether it’s going to be a selfish decision or a selfless decision. I have to say, the name almost lends itself to your situation, was that somewhat intentional or just perfect coincidence? I think its perfect coincidence, when we wrote the record and we didn’t have a theme in mind, which I think is the best way to do it as there’s more freedom to let the songs be themselves, but the underlying theme was starting over, like second chances and that every morning is new. You mentioned that you worked with producer Howard Benson once again, what did he bring to the table on this record that you may not have thought to do on ‘New Horizons’ or on your previous two releases? He’s starting to focus more on the progression of what’s going on in music right now and trying to shift away from the active rock to the more modern rock but we’ll see how that pans out because we’re a rock band at heart, we’ll let the songs write themselves. On this record he was really good at bringing up the lyrics, bringing up the songs and I think that’s what he’s done on these songs. We recently chatted to Jasen from Drowning Pool and he said that touring with you guys was “I can’t stress how much fun that run was, kind of like something out of a cheesy movie, everyone just got along so well.” Was that the perfect tour for you guys? That’s a really good description of the experience of the Drowning Pool tour *laughs* it was a cheesy movie, it was so much fun, that was probably one of the most fun tours that we’ve ever done. We Flyleaf guys we’re very introverted people for the most part, and it’s really hard to bring us out of our shells, especially when we get in the crowd and with the people we’re hanging out with for the first time, but those Drowning Pool guys, they were so easy to hang out with and we were able to be ourselves and just have fun. It was like a family reunion the whole time *laughs* and it was a lot of fun. A good way to introduce Kristen to the fans as well it would seem? Absolutely, to me she’s much more extroverted than the rest of us guys which has a blessing as she’s opened up a whole lot of doors for us, she is just a likeable person and she’s a go getter you know what I mean, she’ll start conversations with strangers and want to go out there, it’s really inspiring to the rest of us. In the just over ten years as a band, besides the singer change, what would you site as the biggest moment you’ve experienced within the band? There have been so many huge moments, I don’t know if there’s been the biggest moment, but playing the Muz- TV awards in Moscow was pretty intense and amazing, and then we did a festival in England and Rage Against The Machine headlined and we got to play the main stage and that was awesome. Then we played Rock im Park and Rock am Ring with Metallica and that was ridiculous, I think that was 06 – 07. I mean, so many huge things have happened in our career that there’s not one huge event there’s all these events that create this amazing story. Now looking back at your first album, it’s around eight years since then, but over the course of the three albums, how have you personally seen yourself evolve as an artist? It’s like a subtle evolution, you become a better player without really trying, you’re just playing every night and writing songs and being around guys like Corey Taylor and Jim Root and Jon Davis and Munky from Korn, the P.O.D. guys, all the heavy hitters, just being around that, it’s like their presence infiltrates your being in a kind of way *laughs* but they permeate and if you’re in that area with them they kind of rub off on you a little bit here and there. I don’t know, it’s an unconscious evolution, you take input from all these different artists and put them into your playing and put them into your art without even thinking. Besides finally getting back to Australia, what does the rest of the year have in store for Flyleaf? We have some dates in South America and Mexico City, we’re going to Japan, we’re doing another US tour starting in July, and then we’re releasing a live EP from the Drowning Pool tour that we recorded at the shows with Kristen on there and then hopefully we’ll release some new music with Kristen. Is there anywhere that you haven’t yet toured that you want to get to? Definitely, we’ve been to Africa but we haven’t played there, so would love to play Johannesburg or South Africa, or anywhere in Africa. Love to play South East Asia and the Philippines; I know we have a lot of fans in the Philippines and Manilla. It would be awesome to play in China and I think that would be a huge thing as well, there are a lot of countries on the bucket list. We are so excited to come back to Australia, I think that’s the one thing we always get asked is ‘Why don’t you come back to Australia?’ so we’re real excited to come back and rock out with you guys again. Thank you all so much for the support over the years it’s been amazing.